Interlude is a relatively new section of DCI.org dedicated to periodically telling the longer, more in-depth stories of the drum corps experience. If you have a longer drum corps essay that perhaps metaphorically relates to larger life, this is the place for it (writers seeking an online clip, here's your chance). Send your completed essays, along with a brief bio and even a picture (and your own e-mail address, if you so choose), to content@dci.org with the subject line "Interlude." We look forward to hearing from you! Jon Hollis of Pittsburgh sent in this story: Reading the new "High Release" and "Transpose" columns has inspired me to share my own story of dreaming to march in a drum corps. I am a 17-year-old senior in high school, and I have loved marching band since my brother started seven years ago. In July of 2001, I attended my first drum corps show, the Three Rivers Summer Music Games. At first, I didn't know what to expect; but after seeing the Bluecoats, Phantom Regiment, Crossmen and Cadets up close only a couple of weeks before finals, I was in love. 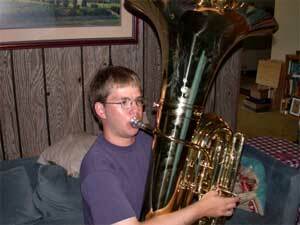 Jon Hollis plays the tuba he bought on Ebay. Fast forward to Thanksgiving 2002. Now a junior and a section leader in the band, I wouldn't miss the PBS broadcast for the world. Yet, as I sat on my couch in awe of the Cavaliers' "Frameworks" show, my dad could only criticize. He never has understood the whole "band thing," and to him, corps seemed totally stupid. Still, my mother whispered to me, "If you want to do that, I will support you all the way." I thought it was great to have my mom, who I love very much, be so supportive. But I didn't really consider marching in drum corps an option -- I play clarinet and bassoon. I had never played a brass instrument in my life. Then, for the second year in a row, I went to BOA's Summer Symposium in Bloomington-Normal, Illinois. As part of that symposium, we would be rehearing and performing with the Cavaliers. It was great, especially since Rob, a great member of our staff back home, was marching with the Cavies. (Read a story about band students performing with the Cavaliers as part of that symposium) The drum corps show that coincided with the symposium got rained out, and we went inside, which was almost as good. You see, we got to sit 10 feet from every corps' pit during the standstill, right in the focus of their sound. Sitting there, with the waves of sound from Spirit and the Cadets and the Cavaliers filling my head, I knew that somehow I had to be part of that. So all summer I planned on how I would pull it off, and with the help of Rob's father, who is our band's arranger/composer, I found a tuba on Ebay. I'd always admired the contra players, marching so gracefully with their great big silver horns. Now the hard part. I had to justify spending money that I didn't have on an instrument I didn't yet play. My father was furious, and the auction was almost over. I typed up an explanation of my dream, illustrated with pictures of Phantom Regiment, the Blue Devils and, of course, the Cavaliers. It was a hard sell, but after a long walk, my father accepted the idea, and let me pursue my dream, even though he did not understand it. To my great surprise, my dad actually wanted to drive to Cleveland and pick it up. That evening, I was on my way to achieving my dream, learning all the basics, as seen in my picture. And my father and I haven't been this close in a long time.